A proper model of your exhaust system provides a critical boundary condition for your underhood/underbody thermal management. Many different simulation methods are chosen today based on the level of fidelity that is required and the boundary conditions that are available. There are four widely recognized methods for simulating exhaust systems. The first way you could model your exhaust system is by assigning temperatures to the exhaust surface. Based on your assigned temperature, a thermal solver can predict the radiation to the surrounding components. The advantage of assigning temperatures is, if you have test data, you can assign those values directly to the model. The disadvantage is this type of modeling is low fidelity. Typically you will assign a single temperature to an entire component. Another problem with this method is it is difficult to run a transient scenario using this method. Somehow you will have to get an entire transient curve to assign to your component. Lastly, as you make design changes to your system, the designated surface temperatures will not automatically update as this is not a predictive method. 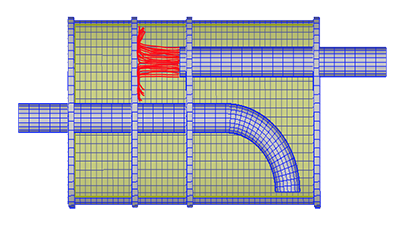 The second method for modeling exhaust systems is using 1D convection and fluid streams by defining fluid streams, fluid parts, or coupling to a 1D tool (such as GT-SUITE) to predict exhaust gas temperature and surface temperatures. This method is predictive, so when you make changes to your design, the model will update accordingly. The disadvantage to this method is that it requires manual set up, meaning more time required of the user. Another drawback is that the convection correlations for this method are based on standard duct flow. These correlations were not developed specifically for exhaust systems so there could be some discrepancies in the results you receive. The exhaust stream feature in TAITherm is a 1D convection stream that is predicted and automatically generated based on your 3D geometry. It is a predictive model that offers high-resolution results but with simple inputs. Another advantage is that the convection correlations were explicitly developed for exhaust systems. This tool also includes convective augmentation influences such as entrance effects, pulsation as each cylinder clears in the engine, as well as specific components like catalytic converters, turbochargers, mufflers, and more. It is useful for steady-state or transient simulations. The highest resolution method would be to simulate your exhaust system using a CAE code that simulates computational fluid dynamics (CFD). This method is also predictive, but the disadvantage with CFD is the arduous runtime. With this method, you are attempting to fully resolve the gas flowing through the system which requires a lot of elements to be solved. This type of simulation does not work well for transient scenarios as it is too computationally expensive. 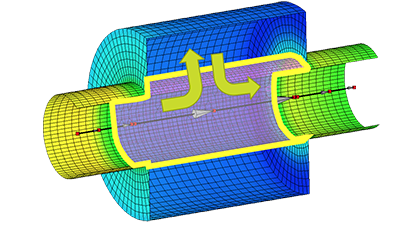 We will continue to walk through the challenges of muffler modeling using the Exhaust Streams in TAITherm method. We believe this approach is the "Goldilocks method." It allows us to get the fidelity we need along with a fast runtime for our steady-state or transient simulations. 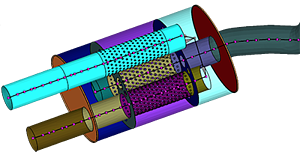 The primary problem for modeling mufflers is that every muffler is different - different chambers, pipes, baffles, etc. As a thermal analyst, sometimes you know what the internal geometry of your muffler will be but sometimes you won't. You need different ways to model those mufflers. The Simple Chamber was introduced in TAITherm version 12.4. It is a good option when you have no internal geometry (or when the supplier has not yet told you what that internal geometry will be). It uses basic pipe flow correlations with some modifications behind the scenes to model the convection. This Uninsulated Pipe Chamber also does not include internal geometry. 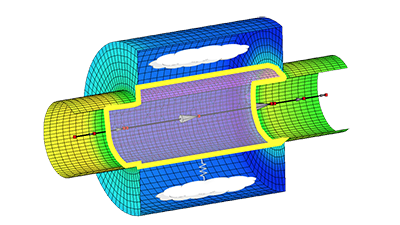 Implicitly, TAITherm will model a pipe going through the chamber. Frequently, these pipes are perforated, so an available input allows you to find the percentage of flow that is going through that pipe and is being exchanged with the gas outside the pipe but inside the muffler. It is usually a small percentage of the actual flow. You also have pressure pulsations that are dampening out or enhancing specific frequencies acoustically, but that also allows for heat transfer. These effects can be accounted for by inputting that percent perforation. For heat transfer, TAITherm will calculate radiation from that implicit pipe to the surrounding geometry. You will also have convection in that outer area between the pipe and external geometry and then advection for the mass flow between the mainstream and the cavity in the muffler. The set up for the insulated pipe is the same as the set up for the uninsulated pipe, but instead of having an empty cavity around the pipe, there will be a porous, acoustic-absorbing material around the pipe. Because the material is porous, you can still define a percent perforation to control the amount of advection and the mass of gas that is flowing into the insulation material. TAITherm will predict the conduction through the insulating material between the implicit pipe and the exterior geometry as well as the convection and advection of the gas that flows into the insulation material. The Open Chamber model is very similar to the Simple Chamber as there is no internal geometry. You will also have direct convection from the exhaust stream node to the exterior geometry. However, the Open Chamber allows you to define impingement points. If you have a pipe that is going into the muffler, you know that the pipe's opening will make a small difference on the adjacent wall. You can define a point on the wall as an impingement point, and TAITherm will augment the convection in that area. These points will allow you to identify some of the hotspots that would typically be seen in a muffler. 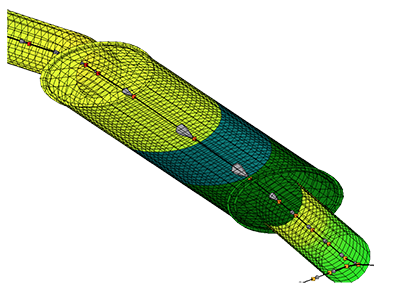 To see the impact that these muffler chamber types have on a simulation, watch our Muffler Modeling webinar below. Steve shows the results he received by simulating each of these chamber types. We hope you found these descriptions helpful. If you think these features could improve your exhaust modeling process, please reach out to us. We are happy to answer any of your questions or schedule a demo to show you what the Exhaust Tool can do.